Do un-scalloped kilts need reinforcing? Thread: Do un-scalloped kilts need reinforcing? 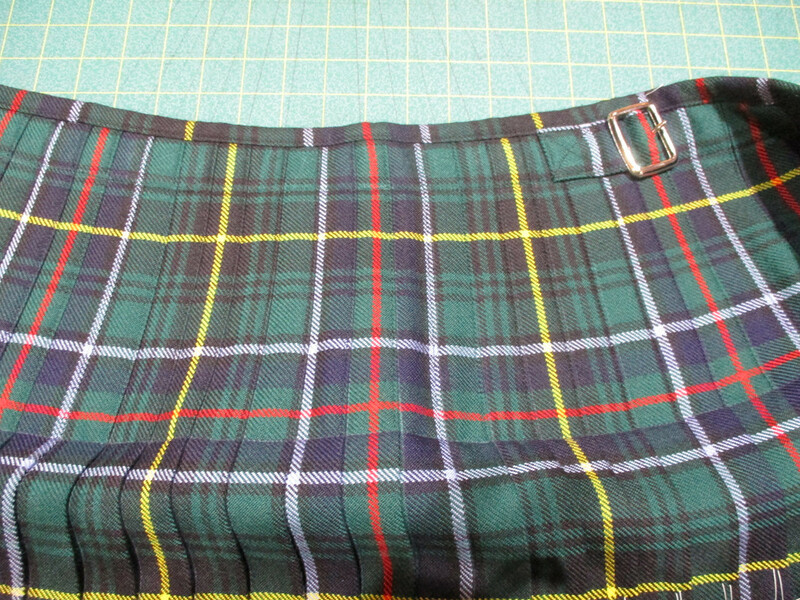 I've been looking around and haven't been able to find a definitive answer, but as the titles says: Do lower yardage, un-scalloped kilts need any reinforcing with a stabilizer? 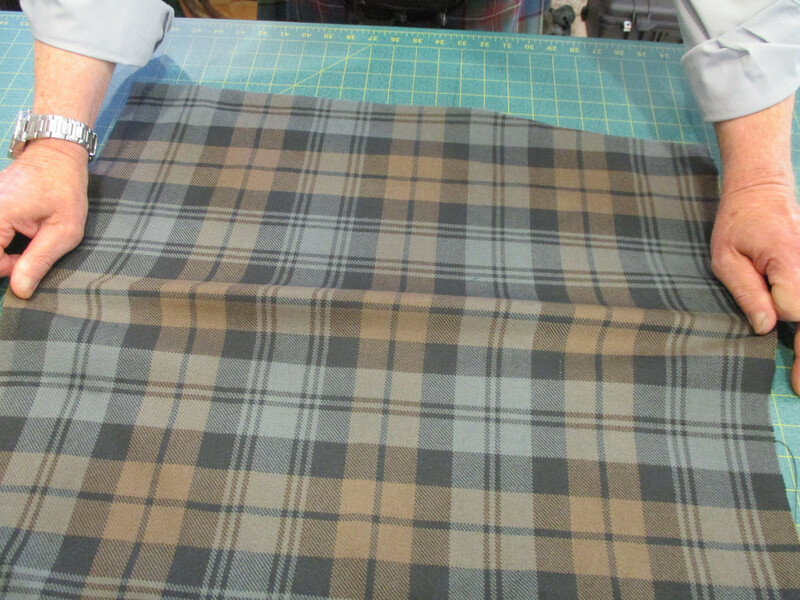 I've found some really great threads from Mr Steve Ashton on the importance of reinforcing and stabilizing a scalloped kilt properly, but I was thinking along the lines of a 4 or 5 yard kilt that doesn't "need" to have the pleats scalloped. The more I read, the more I'm tempted to fashion a belted plaid from some regimental wool for my farm kilt. Last edited by huntgathergrow; 30th October 18 at 06:54 PM. Reason: Reference to specific kilt makers seemed unneeded. The reason for the internal elements is not because the pleats are cut away, it is due to the fabric. If you are just wrapping some fabric around yourself and gathering it in a belt you are not putting any stress on the fabric like would be done with straps and buckles. I wear the kilt because: Swish + Swagger = Swoon. Ah! I see now. Thank you for the answer. I'll be rethinking my options, now. What do you mean by "un-scalloped"? Are you referring to the pleats being cut out? 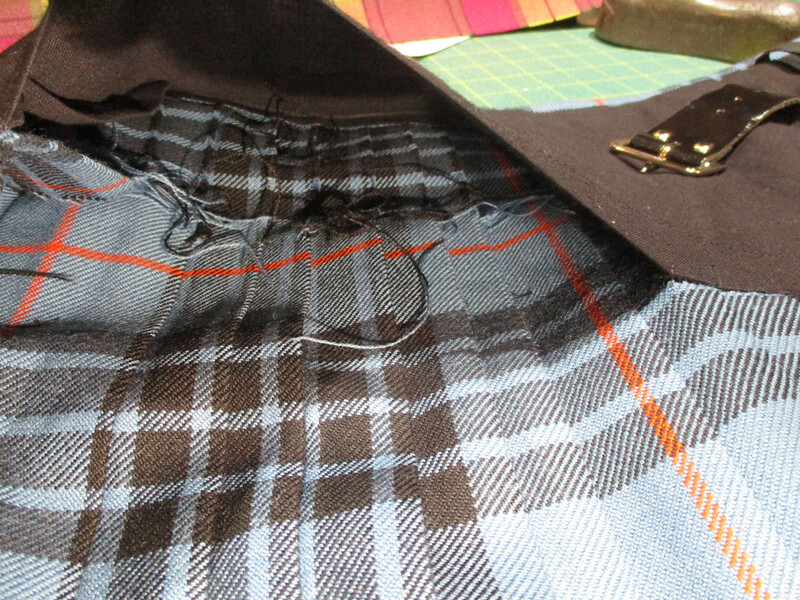 A full Contemporary kilt can be stitched by hand or by machine. Even my machine stitched kilt have a stabilizer. However, machine stitching compresses the layers of fabric so the result is about the same effect as what the interfacing does. Provides vertical stiffness to the garment and allow the pleats to hang and swish properly. 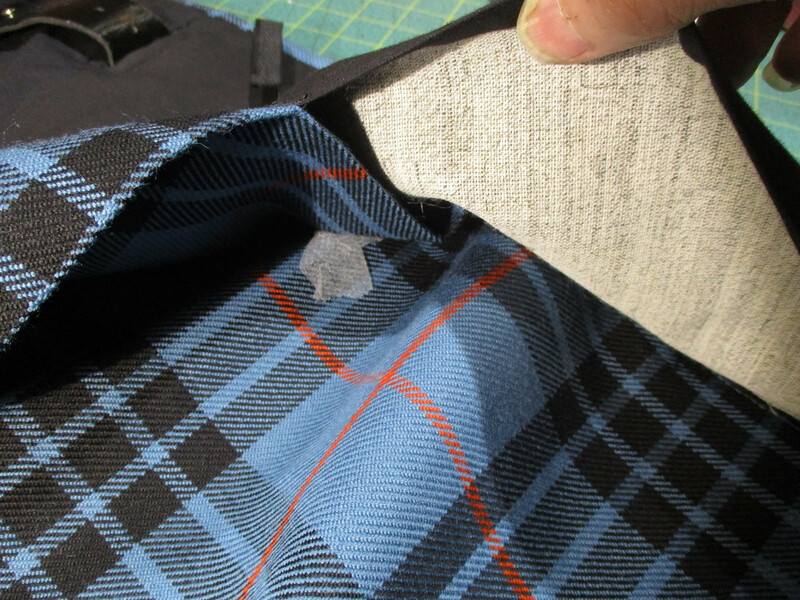 So additional interfacing is not required on a machine stitched kilt made this way. 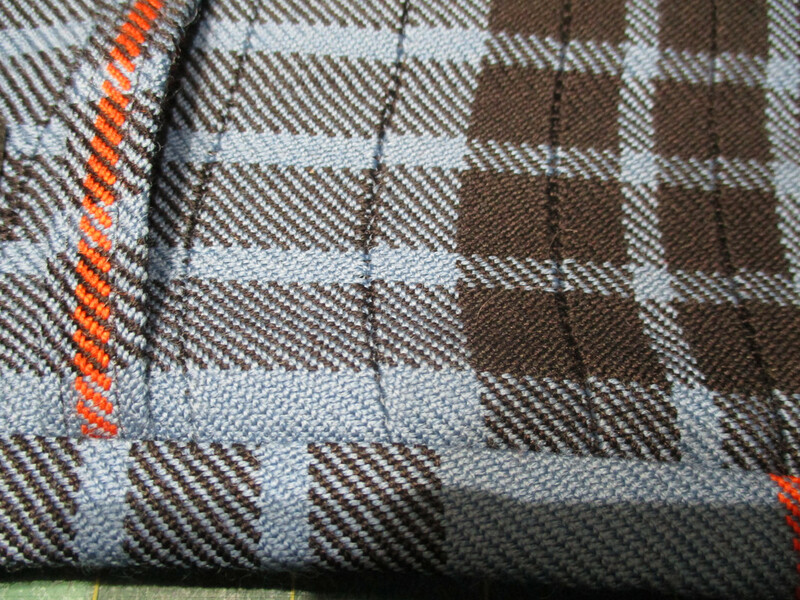 The stitching provides about the same vertical stiffness as interfacing. The back of the kilt will still stand up all by itself. 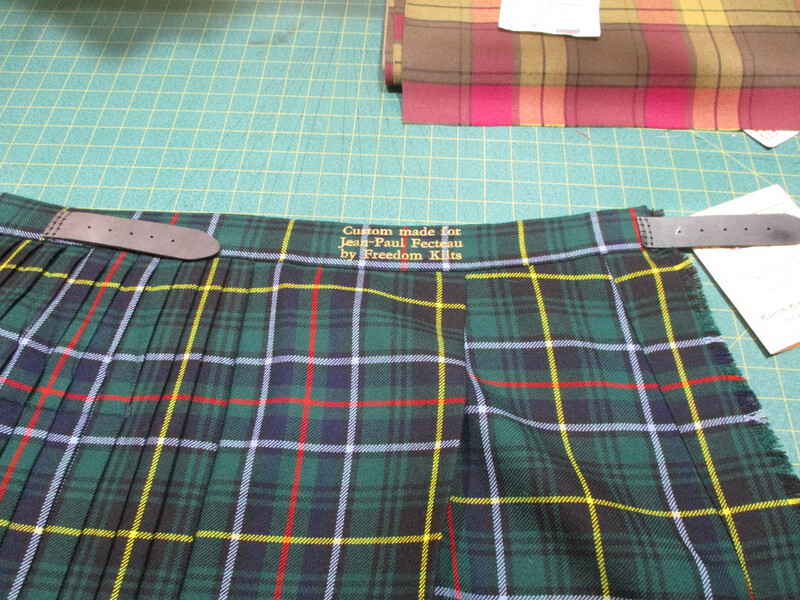 In places this kilt has 8 layers of fabric stitched together into a uniform and integrated unit by machine. The horizontal strength, to keep the stress of strapping the kilt on and moving in the kilt, is done with stabilizer. This is a strip of very strong fabric that does not stretch. Much like an internal belt. The stabilizer is hidden inside the back of the waistbanding. This is where the straps and buckles are fastened. However, from the outside, this kilt looks very much like an iconic kilt. Now please remember that I am talking about my Contemporary kilts. 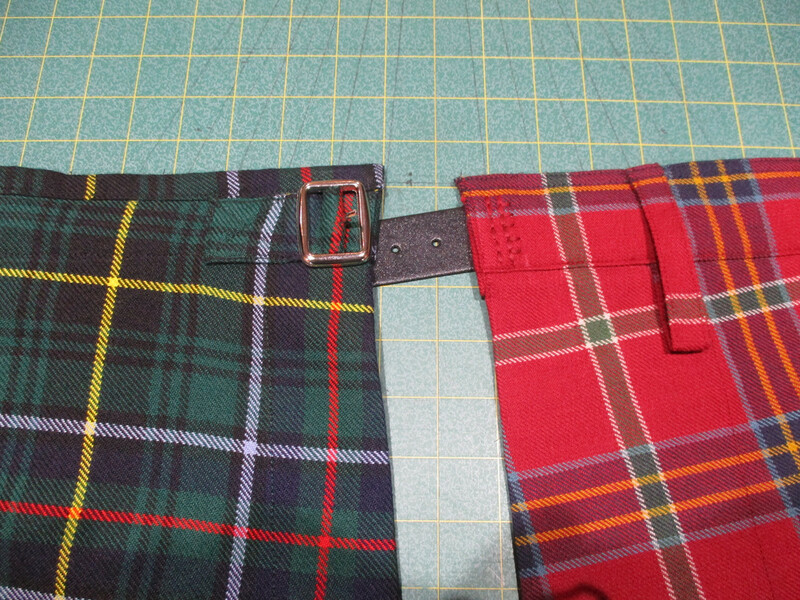 It is possible using the Contemporary kiltmaking method to make these two kilts exactly the same way. On the left is what I call in internal waistbanding and on the right an external waistbanding with beltloops. While they give a totally different look to the two kilts, they are both constructed exactly the same. Some customers prefer one appearance, other customers prefer another appearance. Last edited by The Wizard of BC; 31st October 18 at 04:47 PM. Unfortunately this level of construction is not present in all kilts. Not even among the Scottish houses who advertise as providing a premium traditional kilt. Recently a customer brought his kilt into my shop for alterations. He was asking me to install buttons for braces as he felt that his kilt was going to fall off after being worn for a while. Imagine my surprise when I got this kilt on my table. 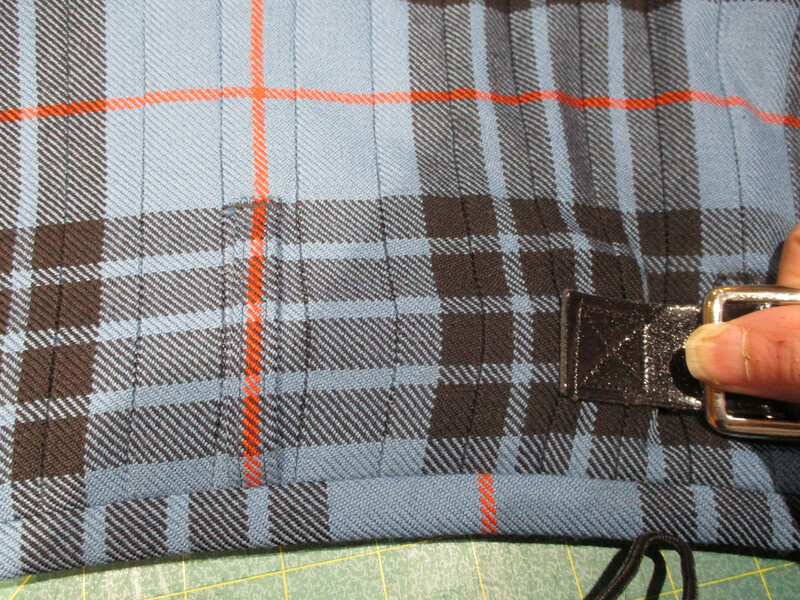 This is a totally machine stitched kilt using the technique known as "blind machine stitching" where the pleats are stitched open and then folded back after stitching to hide the line of machine stitches. Here you can see the line of machine stitches known as "Stitching in the ditch" that fastens the waistbanding. What I found odd though is that the liner is only tacked into the inside of the kilt in a few places. The whole purpose of the liner is to cover and hide the internal construction. The construction of this kilt is readily available. 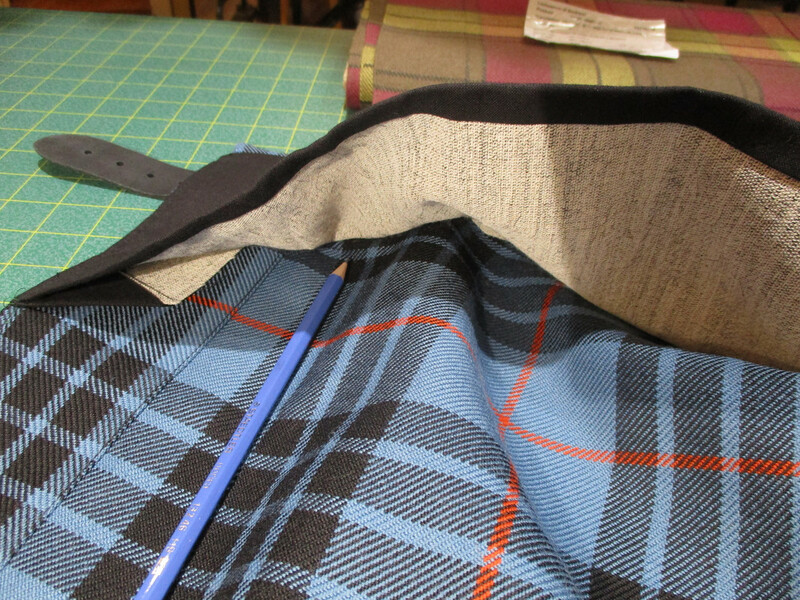 Notice please that while the fabric inside the kilt is cut away to reduce bulk, there is no interfacing or stabilizer present. What this means is that with even a little stress on the kilt all the stress must be absorbed by the fabric and the stitching. 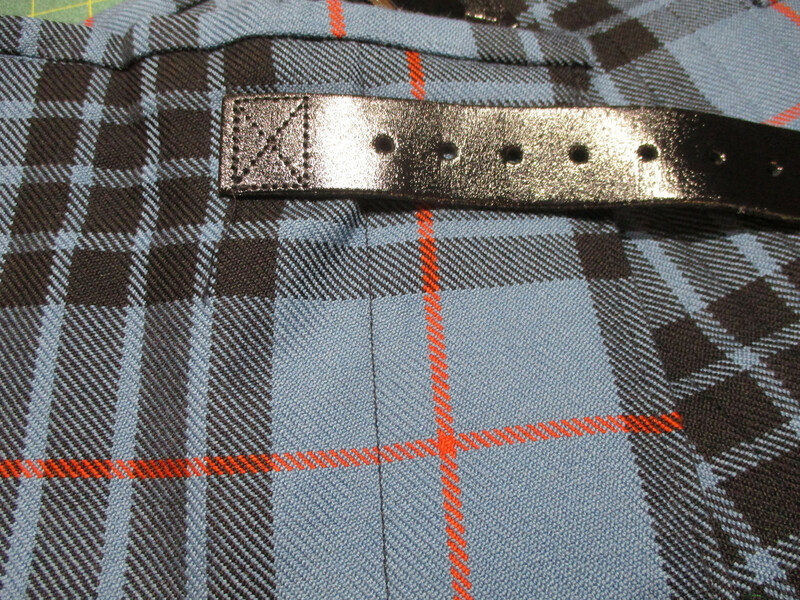 Here you can see the back of the kilt stretching between the buckles. This stretching is the reason that the customer felt that the kilt was loosening and may fall off. The stitching of the pleats is already beginning to be effected by this stress and is not far away from failure. There is single piece of interfacing behind each apron. But this piece of interfacing is not attached to any other structural element of the kilt. 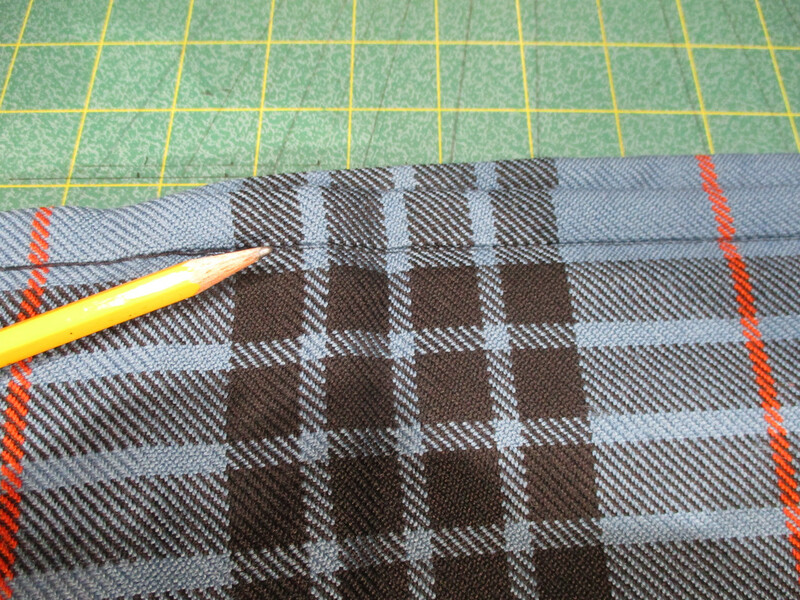 Where you see the pencil pointing is where the strap is sewn, not the the interfacing but just to the outer Tartan fabric. On the under apron you can plainly see the small piece of fusible that was intended to hold the Reverse Pleat in place. But it is not even fully melted as would be expected. This lack of internal strength has already caused permanent distortion to the Tartan fabric. I simply do not have the heart to tell this customer that the Scottish made kilt that he is so proud of is not made very well. I will put the braces button on, which is what he asked me to do, and let him have his kilt back. Last edited by The Wizard of BC; 31st October 18 at 04:44 PM. I have some heavy kilts as quite a few are 'ladies length' of 27 inches or even ankle length. First I build in ease, and then lose a couple of inches from the top edge as that removes strain from the fabric, my waist being compressible. Secondly I have quite a stash of all sorts of useful reinforcements so the strain of holding the kilt is taken on military quality webbing. Thirdly I have a reel of thread which is extremely strong, and I use that to attach the straps and buckles. My grandmothers both made clothing and used small but significant methods to reduce the strain at points of wear, which made a real difference to the length of time garments remained in good condition. I presume to dictate to no man what he shall eat or drink or wherewithal he shall be clothed." -- The Hon. Stuart Ruaidri Erskine, The Kilt & How to Wear It, 1901.